mybeardeddragons.co.uk • View topic - Hiya, new to forums and beardies! Help please!? Post subject: Hiya, new to forums and beardies! Help please!? Hiya, I'm Lindsay and I'm from Cumbria. I'm new to forums and to owning bearded dragons and really need some advice! Everything I read seems to tell me something different! Apologies in advance for the long post but I want to try and give as much detail as possible to make sure I do the right thing. 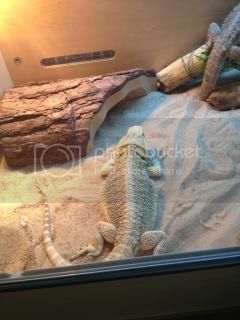 On Wednesday evening I bought 2 adult bearded dragons. 1 male and 1 female. We've named them Jango (male) and Indie (female), so I'll refer to them by their names rather than 'the male' and 'the female'. The previous owner said they owned them since they were a year old and that they are now 3 years old. Jango has a stumpy tail and a stumpy toe which they said has always been like that so must have been injuries from when he was a baby. They are tame and we'll handled. 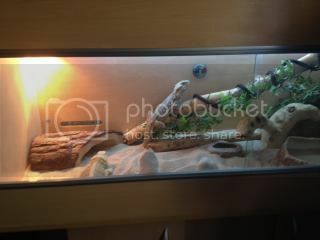 4ft vivexotic vivarium, UV strip light, basking light, exoterra water dish, food dish, and worm bowl. Basking log, climbing log, fake plants, rocks, sand, probe thermometer, exoterra bearded dragon adult soft pellets, calcium D3 supplement. The basking light should be on for 8hrs a day. The UV light is really just for our benefit for looking into the viv at the beardies so doesn't really matter how long it's on for. They should be fed mixed salad leaves every day sprinkled with the adult pellets. Then have mealworms or locusts once every one or two weeks sprinkled with the D3 supplement. They said not to bother with crickets because they've tried them numerous times but they won't eat them. 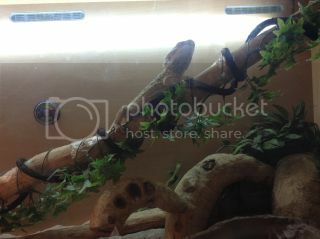 Then to give them a bath every 2 weeks and clean out the viv every 2 months. Handle them whenever I want to. Obviously from the reading I've done I know that beardies need the UV light so since I've had them I've had it on for 12hrs every day, I've also had the basking light on for this long as I'm not sure how long this should be on for? I can't give hot and cool side temperature readings at the moment as the probe thermometer I was given doesn't work and so I've bought one online but it hasn't arrived yet. I did put a stick on exoterra thermometer on the back middle of the viv so I could monitor the central temperature which reads 85f through the day then gets to 90f by the evening. It reads 70f on a morning when the UV and basking lights have been off overnight. Feeding is something I'm particularly worried about with Indie as I haven't seen her eat anything! On Thursday morning I put in fresh mixed salad leaves and kale sprinkled with the adult pellets, which neither one of them seemed bothered about. Then I put in 5 locusts sprinkled with the D3 supplement which Indie showed no interest in but Jango went straight for them like he was starving and ate the lot! Overnight on Thursday some of the salad leaves and pellets had been eaten but I don't know which one had eaten them. Friday i took out what was left of the salad and put in blueberries and strawberries - again no interest from either of them. I also put some mealworms in the worm bowl which Jango went for and had some but Indie wasn't interested. None of the fruit was eaten overnight so I took it out this morning. I thought maybe Indie didn't go for the locusts because Jango was there so I put some in sprinkled with D3 supplement when she was in the viv on her own but she still wasn't interested, even when a locust was walking on her she didn't try to eat it! 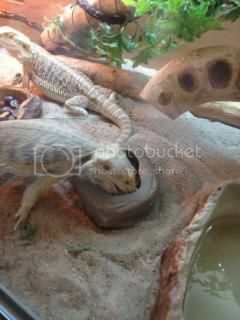 So Jango ate them again when he went in they also still have worms in the bowl which I've not seen Indie touch either! So I think I'll put salad leaves and pellets in again later in hope that it's Indie eating that through the night. I put them in the bath on Thursday so I could put some clean sand in their viv and put some extra logs in that I'd bought, and they both seemed to enjoy it! And they both poo'd in the bath as well which they don't seem to do in the viv? I also put them in the bath today as Jango is shedding and I read that bathing can help with this? They both had a poo in it again! Any help would be greatly appreciated as I want to make sure I'm looking after them properly and that they are happy and healthy! Post subject: Re: Hiya, new to forums and beardies! Help please!? Where do I start? It's a miracle they're alive and looking well given the previous owner's treatment of them. About the only thing they got near correct is feeding veg daily, so I'll try and cover all the points that I can to get them settled and give you a (hopefully) trouble free time with them.The equipment you have is all OK but you do need a good digital thermometer. Firstly they can take a week or so to settle after having been moved so that may be why one isn't feeding, however bullying can also cause this so you need to read this sticky viewtopic.php?f=20&t=9750 and be well aware of the consequencies of keeping two in one enclosure. Feeding - mixed veg daily, this sticky covers the acceptable veg etc.. viewtopic.php?f=10&t=110 and live food every second or third day. Live food should be dusted with calcium powder (not the veg) and the jury is still out on the use of D3 so Id only use that weekly. Live food should be crix, roaches, superworms or silkworms, most other feeder grubs are fattening and can cause health problems if used too frequently. Correct temps are a must and should be about 39~42C on the basking spot down to mid 20's at the cool end. Lights on for 12~14 hours a day in summer reduced to 10~12 hours daily in winter. Unless your house drops below around 16C overnight no overnight heating is needed as they need a cool period for sleep (same as us). Bathing is covered here viewtopic.php?f=8&t=1372 . Too much exposure to high humidity can expose them to respiratory problems and as long as they have something to rub on they will shed quite happily by themselves. Sorry to have contradicted most of what you've been told but after many years breeding dragons in their home country I'd back what I've said against these so-called UK keepers. Basically I'd recommend moving the female to another enclosure, altering the feeding regime and things should settle down. By the way, how old is the UV light. Anything over 6 months and it's pretty well useless. Hi, thank you for all of the advice! I have no idea how old the UV light is and I can't seem to get hold of the previous owners to find out so I've ordered a new one online this morning as well as calcium dust and crickets. Even though they said they wouldn't eat them I'm gonna try them anyway. I'll give the viv a clean through today to get rid of any mealworms that might be hiding in there and I'll order some silkworms. My digital thermometer should be here tomorrow then I can get some more accurate temperature readings and I'll post them on here to see what you think? I forgot to mention that the previous owners had said about mating and that they had been mating in the past and had eggs but they didn't have an incubator and so just removed them from the viv and threw them out. They said they will mate again and so if I don't have an incubator I should just do the same with the eggs, is this right? After reading the sticky about keeping beardies in pairs I don't like the idea of keeping them together at all. When buying them I assumed they were fine together as they are 3 years old and I was told that they have always been together. I don't have the space for another viv in my house so now I'm faced with the choice of either just keeping them together and risking bullying - which could already be happening as I'm not yet clue'd up on beardie behaviour. Injuries or worse! And I don't want to put Indie through the stress of constant mating either. Or I would have to rehome one of them. 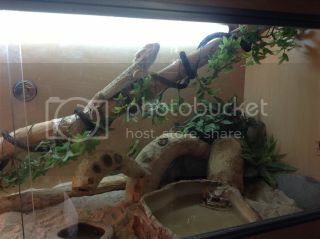 Regretfully I'd do one of two things -provide a second viv if humanly possible otherwise re-home one of them. I've seen far to many cases of injured dragons, sick through bullying and worn out females from overbreeding to risk keeping two in one enclosure. It's quite probable that she is already gravid and may produce up to 5 clutches of eggs this season so all you can do there is freeze then dispose of the eggs. I'm afraid you've been caught by another irresponsible owner who has no though for the welfare of his reptiles! Sorry to have to tell you this but there's no easy way round it. Hopefully I can find a new home for one via this forum. Should I stop handling Indie if she could be gravid? Welcome to the site Lindsay, you have joined a great site and everybody helps out with ideas and question. Ricks knowledge is wide and very good, he helped me with my quires. Rick has been a great help with his advice! Any advice on finding a new home for him? or does anyone know of someone looking for a beardie? Hi Lindsay…welcome to the forum. I have only very recently joined, and already am getting masses of useful information from reading old posts, as well as people posting answers to any questions…superb community. It makes my blood boil to hear of the careless nature of the person you got Jango & Indie from - they have absolutely no regard for the welfare of the animals they have! I have rescue Parrots, cats, dog etc, and there is so often a sad story behind them. Boris is, at the moment, climbing all over me as I am typing, and having a run around the living room. They are fabulous creatures, and have really great characteristics. I feed mine with fresh veggies and herbs from my herb garden every day, and crickets three times a week. I have changed a red basking light to a normal household 100w bulb as per Ricks advice, as they actually see red, and if the light keeps coming on and off during sleep time, it would be like you or I trying to sleep in a constantly hot room, and with the lights going on and off!! I hope you sort your dileama regarding re-homing or keeping. I had the notion of getting a female to breed Beardies - but, after all of the research I have done, and the things I have read on here - I have decided against it - the thought is very appealing, and I would love to see the process through, and enjoy seeing the little bear dies emerge from their eggs etc - but, passing them on would be a huge problem, as there are simply so many of them available. If they were to have only two or three babies, then I would do it - but, alas they have huge clutches !! I would love to borrow your books, thank you. I will private message you my address. In regard to the basking light I'm not sure what kind it is in the viv at the moment as it was one the previous owners had put in there so I ordered a pro rep reptile light bulb clear spot 100w which I'm hoping the post man will bring tomorrow. Is this ok for them? I assumed when buying Indie and Jango that the info the previous owners had given me was correct as they had owned them for 2 years but now I realise I was wrong and I'm glad I joined this forum! Hi Indie - dragons love watching people and are happiest when they can see what's happening around them, so a busy room with the viv about 3ft off the ground is ideal. You may advertise him on here but I'd also suggest using one of the pre-loved sites (you do realise that you can stack vivs on top of one another?). Try and keep bleach fumes away from the viv and if/when cleaning the viveither air it for 24 hours before returning your dragon to it or use a product called F10 available from EBay or most vets. You can actually get away with standard household RO80 spotlights at less cost than reptile recommended lights it's just the UV strip that needs regular replacing and for that I'd recommend Arcadia lights. Any more questions/advice just keep asking. I have ordered a new strip light. The viv is currently in my oldest sons room which he's always in playing Xbox etc and has his friends over, my other 2 boys are in and out of there all day too so Indie and Jango get to see a lot. Indie was digging around quite a bit last night so could this mean she's gravid? If so should I stop handling her? Quite possible that she's gravid and ready to lay, this would also be why she's not eating.Check our section on breeding as she'll like a laying box , eggs could appear any time in the next 1~2 weeks if she is gravid. Handling her won't hurt. As I said check our section on breeding and then ask about anything your not sure on.